In January of this year, I wrote a piece regarding the topic of Daniel Sprong being sent back to the AHL during the 2017-18 regular season. The Pittsburgh Penguins fanbase had begun to draw comparisons between how "the Sprong situation" was being handled to that of the situation of now former Penguins defenseman, Derrick Pouliot. At the time, I was not ready to so quickly give credence to there being a similarity. Sprong was still a kid fresh out of his final year in the QMJHL and needed some time/ room to grow. Playing in the AHL gave him a chance to potentially do just that. Sprong would end up scoring 32 goals/ 33 assists for 65 points while playing for the Wilkes Barre- Scranton Penguins and he was trending in the right direction. When Sprong made the NHL line up out of the 2018 Pittsburgh Penguins training camp, it seemed as though the similarities between the Sprong/ Pouliot situations were going to be put to bed. Everyone hoped that, come the Thanksgiving break, Sprong would be emerging as one of the top young talents of the year. However, recent events have caused the similarities to glare ever more brightly, so much so that they can no longer be ignored. To much disappointment, Sprong has failed to make even a ripple in his NHL career or impress Head Coach Mike Sullivan. In the past month, Sprong has had one good outing in which it seemed everything was starting to click (versus Vancouver on October 27), but one positive game has still not been enough to earn him a try on a higher line. Sprong has played strictly on the Penguins fourth line and averaged just under 10 minutes of ice time in his last five games played. He has no goals in 12 games, only four assists and sits at a -2 in plus/minus rating. He was a healthy scratch for the last two outings versus Washington on Wednesday November 7 and versus Arizona on Saturday November 10. The Pens Inside Scoop Twitter account noted that Sprong was only being slotted into various spots during the Penguins Monday practice on November 12, which would indicate that he is set to once again set to fill a seat in the press box. "....but he needs to play with Crosby!!!" I will admit that Sprong not even getting a sniff at the top line is a bit laughable, however one must take into account that spots and opportunities must be earned. If he would have scored at least one goal within the last 12 games, it would have helped his cause greatly, but he can't even get a shot off. It is also difficult to try and get a shot away when playing in the defensive end, somewhere Sprong has spent a lot of time, and is still not yet comfortable in. Disappointing play, not living up to expectations, an unwillingness to accept constructive criticism, an unwillingness to adapt or change playing style to not only progress their own abilities but strengthen the team, a bit of an attitude problem and seemingly in HCMS doghouse...it's just a familiar story with a new face. Will Sprong fall to the same fate as Pouliot? Some NHL media outlets think so. 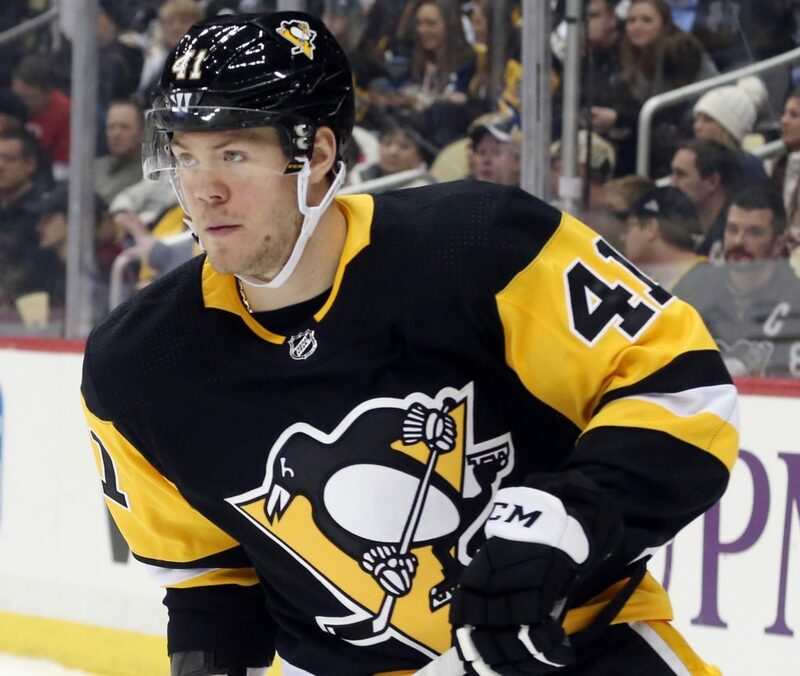 Rumors of the Penguins accepting calls/offers from prospective teams interested in a trade have begun to swirl and will only be fed more and more the longer Sprong stays out of action, but what could the club even get for a struggling fourth liner? Would a package deal with another player have to be put into the works to make any deal happen? There is no telling how many chances Sprong is going to be given to prove why he still belongs in a Penguins uniform, but dealing with Pouliot for so long may have shown management that there is only so much you can do if the player isn't willing to help themselves and isn't helping their team win games. With General Manager Jim Rutherford apparently ready to pull the trade trigger at any moment, Sprong's time in Pittsburgh could be up before it even got started.